In single-phase ac high-voltage (HV) battery chargers, as the input current is enforced to be varying sinusoidally in phase with the input voltage, the pulsating power at two times of the line frequency will be seen on the dc-link. 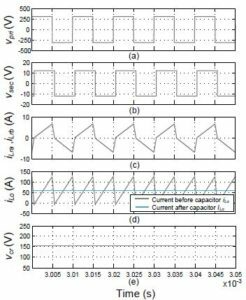 Bulky capacitor bank or extra active filter circuits are needed to assimilate this harmonic current, which become a major barrier in terms of power density and cost. Sinusoidal charging method can be applied, while this might affect the charging efficiency and a deep study is still needed to further investigate on the impact to the Lithium-ion battery. An active filter auxiliary power module (AFAPM) based dual-mode dual-voltage charging system for vehicle application has been proposed. The AFAPM converter has two modes: 1) the HV active filtering mode, in which the vehicle is connected to the grid and the converter assimilates the significant second-order harmonic current; 2) the low-voltage (LV) battery charging mode, in which the vehicle is running and the converter charges the LV battery from HV battery. However, a relay and inductors are still required in that converter to achieve the dual-mode operation. This paper proposes a primary full-integrated AFAPM for electrified vehicle applications with single-phase onboard chargers. The proposed AFAPM converter is composed of a two-phase bidirectional buck converter to work as an active filter (AF) and a dual-active-bridge (DAB) to operate as a LV battery charger auxiliary power module (APM). With the proposed converter, only an extra active energy storage capacitor is needed to achieve the active filtering. All the switches and inductors on the primary stage are shared between the AF and APM. Therefore, the use of a bulky capacitor bank or an additional AF circuit is avoided and thus, the cost, size and weight of the dual-voltage charging system in the electrified vehicle applications can be reduced. To confirm the effectiveness of the proposed converter, a 720 W prototype. Fig. 1: The dual-voltage charging system with the proposed primary full-integrated AFAPM. Fig. 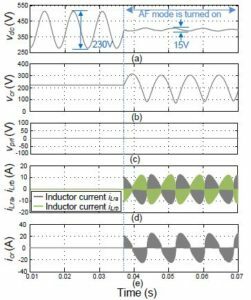 2: Simulation results of AF mode, (a) HV dc-link voltage vdc, (b) capacitor Cr voltage vcr, (c) transformer primary voltage vpri, (d) inductor Lra and Lrb current ira and irb, (e) capacitor Cr current icr. In this paper, a new primary full-integrated AFAPM converter is proposed. The proposed converter is not only a LV battery charger APM, but also an AF for the HV battery charger. A full bridge and auxiliary inductors are shared between the DAB APM converter and the two phase buck AF converter. Only an active harmonic energy storage capacitor is needed to achieve active filtering. As a result, from the harmonic energy storage aspect for the 6.6 kW HV battery charger in the vehicle applications, with the proposed AFAPM method, the volume and cost can decrease to 45.8% and 44.7% of the volume and cost of the conventional extra active filter method, respectively. A 720 W prototype has been built and experiments show promising results confirming the effectiveness of the proposed converter. Xue, Z. Shen, D. Boroyevich, P. Matavelli, and D. Diaz, “Dual active bridge-based battery charger for plug-in hybrid electric vehicle with charging current containing low frequency ripple,” IEEE Transactions on Power Electronics, vol. 30, no. 12, pp. 7299-7307, Dec. 2015. Bilgin, P. Magne, P. Malysz, Y. Yang, V. Pantelic, M. Preindl, A. Korobkine, W. Jiang, M. Lawford, and A. Emadi, “Making the case for electrified transportation,” IEEE Transactions on Transportation Electrification, vol. 1, no. 1, pp. 4-17, Jun. 2015. Jahdi, O. Alatise, C. Fisher, R. Li, and P. Mawby, “An evaluation of silicon carbide unipolar technologies for electric vehicle drive-trains,” IEEE Journal of Emerging and Selected Topics in Power Electronics, vol. 2, no. 3, pp. 517–528, Sep. 2014. A. Mantooth, M. D. Glover, and P. Shepherd, “Wide bandgap technologies and their implications on miniaturizing power electronic systems,” IEEE Journal of Emerging and Selected Topics in Power Electronics, vol. 2, no. 3, pp. 374-385, Sep. 2014.